Babbling Brooke: Sally Hansen Chrome "Nail Makeup"
I love that this stuff is called "Nail Makeup" as opposed to just polish. What I also love about this polish is the color. 'Platinum Chrome' is like aluminum foil with a solid, burnished shine. I find this polish to be very similar to those in the China Glaze Khrome collection, and since this polish is no longer sold, the Khrome collection is the best way to achieve a similar result. Platinum Chrome applies nicely, covering with just one coat (I used two though), and dries very fast. I applied this polish this morning, then went horseback riding and later did the dishes, and I don't have a single chip yet. Oh, and I forgot to put on a top coat too! I'm actually pretty impressed that this hasn't chipped to tell you the truth - it took quite a beating today. As you can see, I used Konad plate m64 with the techno-y design. 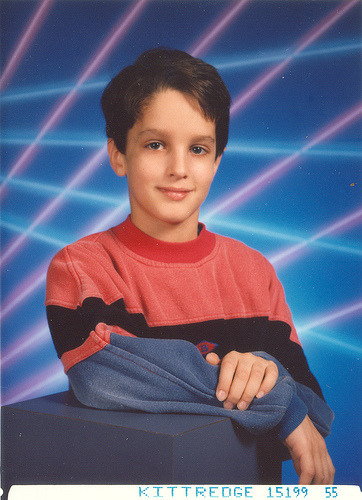 It reminds me of those pictures in elementary school with the black background and neon laser beams shooting everywhere. But it also has a kind of architectural feel, which is cool. i like this look..have u tried the sally hansen for stamping? Thanks! I have used it for small images, but when I try to use it for a design, it dries to fast and it doesn't all transfer. I'd like to try China Glaze Khrome for stamping though. I had those a long time ago in different shades. I like the manicure. I have to order the Khrome collection. You had these too? I love these polishes!